After months of agonising over weight, I have finally decided on what I am going to take on my LEJOG hike. Well, almost! There are still one or two small items that I may or may not take but they only weigh a hundred grams or so and won´t make that much difference to my final base weight. For anyone unfamiliar with the term, base weight is everything in your backpack minus consumables such as food, drink, gas and toiletries and I have managed to get mine down to 7.5 kilos. I could get it even lower but I feel that there is a fine line between reducing weight to make the hiking easier and comfort/safety. 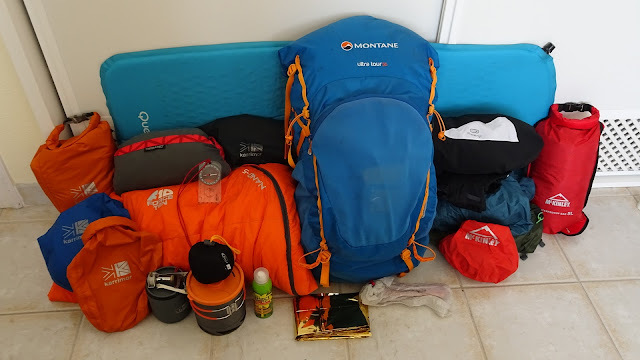 Ultra-lightweight hikers strive to keep their baseweight below 5 kilos and I can see that this is achievable, particularly if you live in a dry, warm climate but the UK is not exactly known for these type of conditions so a little more equipment is probably a wise choice. Plus, there are one or two 'comfort' choices I have made where I could probably have opted for something lighter or nothing at all. One of these is my pillow. 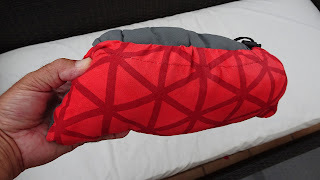 I have included my Thermarest foam pillow which weighs around 185g, I could have purchased a lighter, inflatable pillow but I have owned one of these in the past and didn´t find it comfortable. 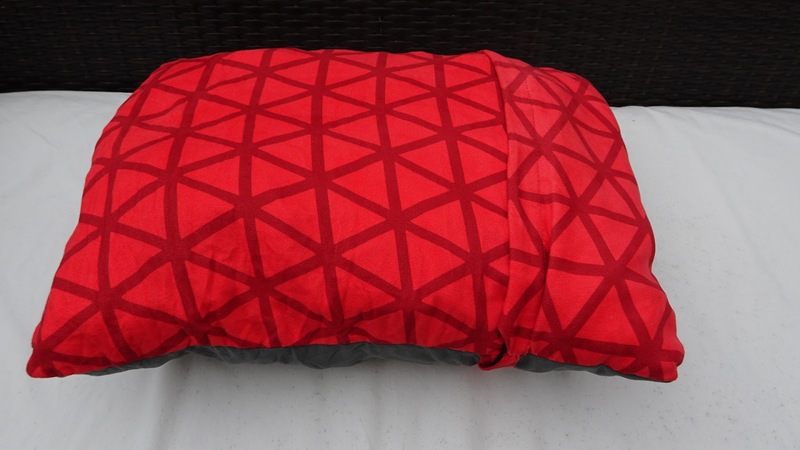 The Thermarest folds down quite small into it´s own pocket and feels like a ´real´pillow. Another item I dithered over was waterproof trousers. I really hate walking in long trousers and always walk in shorts, even in rain. However, on this walk I will be passing through some remote mountain country, particularly in Scotland so it seemed like a sensible move to take them with me for insulation as much as anything. By pure coincidence, these weigh around 180g as well. Lastly, because I am only taking electronic maps, I have decided to take a second back-up device in the shape of my Garmin E-Trex 10. This is in addition to my phone and 7" tablet both loaded with Viewranger app and Ordnance Survey 1:50000 maps for the whole of the UK. Both of these devices charge via USB so the Garmin is a fail-safe as this is powered by AA batteries although I do have a powerbank to charge the tablet and phone. My whole route will be stored on Viewranger and the Garmin and although the Garmin doesn´t have mapping, I can still follow my route on the screen should I be unable to charge the phone or tablet. Hi Gary. What do you think the total average weight of your pack will be? Wishing you all the best with your Lands End to John O'Groats hike. Simon. Hi Simon, sorry only just seen this comment. If you´ve been following my blog you´ll know that I´ve suspended the walk until next spring after a run of bad luck, which meant I was hugely behind schedule. My pack weight as I said above is around 7.5 kilos base weight but with food, water, gas and toiletries I estimate my total weight fluctuates between 10 to 12 kilos. I don´t like walking with much more than 10 kilos on my back so I keep the food and water to a minimum, if I can. Gary.